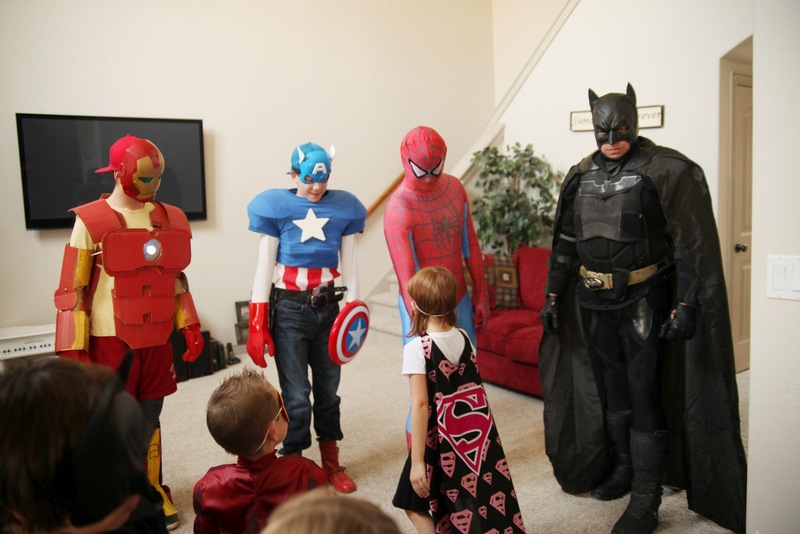 Superhero Birthday Party: The Superhero Guests!! 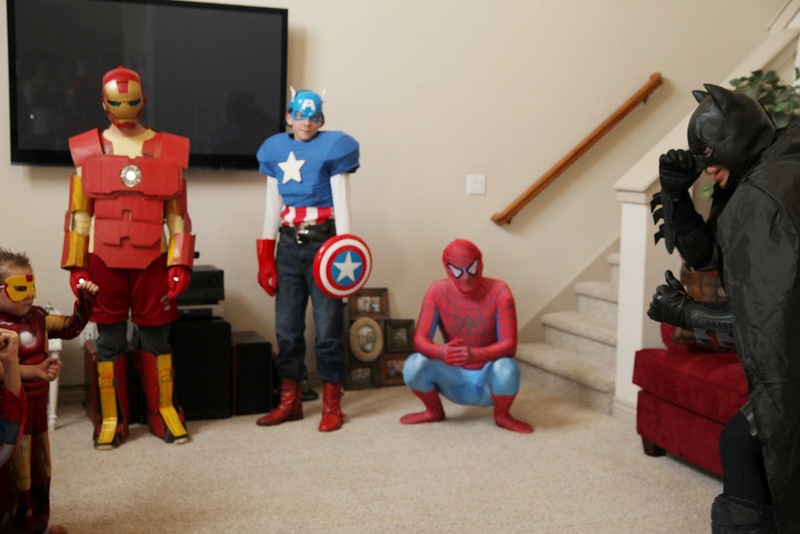 When we walked back inside after the outside games, we had some SUPER surprise guests standing in our living room, all posed in their action hero poses (Spiderman was in a crouch)!! It's funny, even though Jared and I knew they were in there, we both said, "Whoa!" when we walked in and saw them standing there. It really was a pretty incredible sight, seeing these characters from the movies standing in front of us! It surprised everyone and it took a few minutes and a little encouragement from us for the kids to walk up to and meet each character. 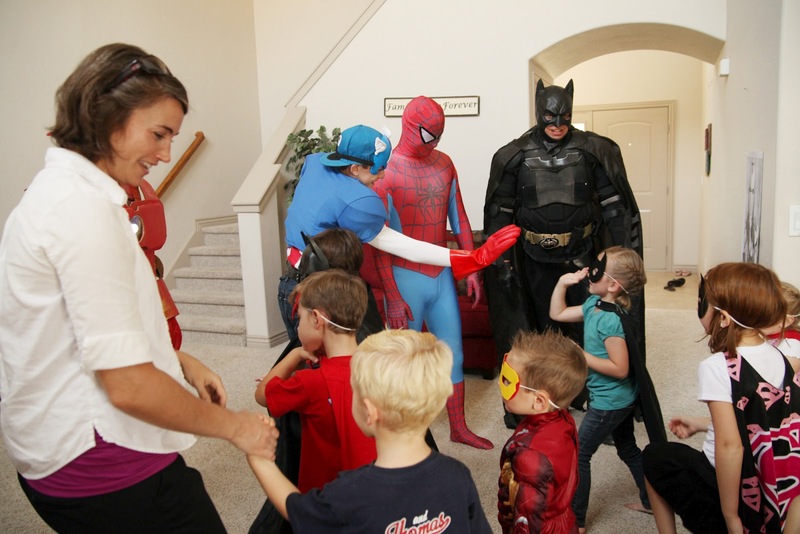 After meeting the kids, the characters took turns showing the kids their "superhero moves". 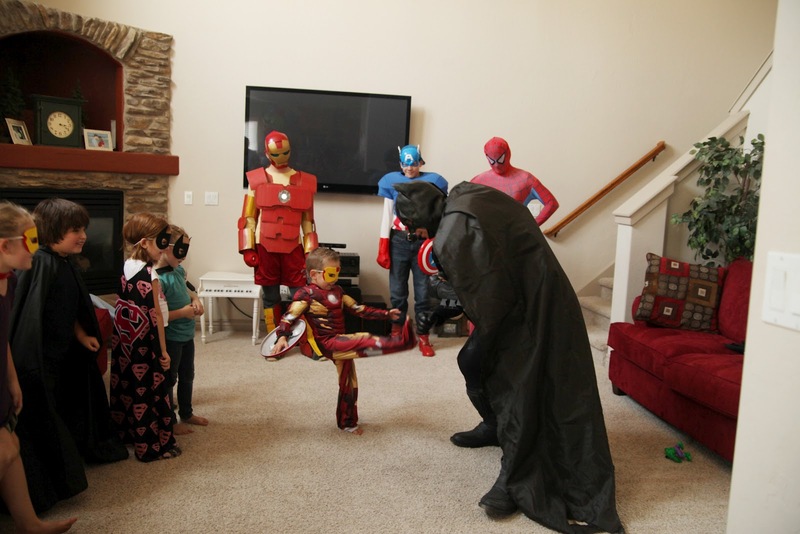 I asked them to do this because one of Dallin's favorite things to do is practice, or show us, his superhero moves (like in the videos I posted of him recently). I knew he would really love this! Batman went first and had a ton of cool things to show the kids! 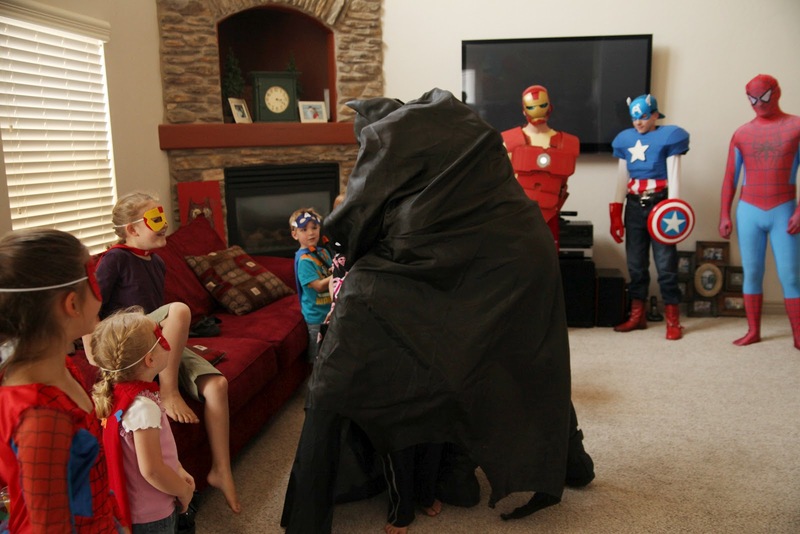 Batman let a couple of kids kick the "armour" on his legs. This is Dallin doing that here (above). Batman showed how he could catch someone in his cape and wrapped it around Coey here. They (especially Coey and Dallin) LOVED this. Dallin still talks about it actually and just yesterday was telling me how Batman catches the bad guys in his cape. Batman also had some cool tools in his belt that he showed the kids, like a pair of binoculars that he let them take turns looking through, and a bat blade thing. 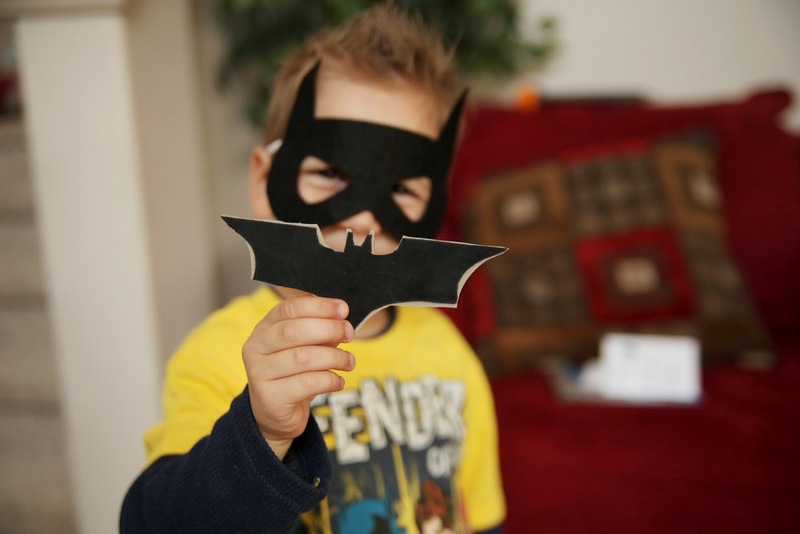 He said he made a bat (blade thing) for Dallin and gave him the one below. Dallin seriously loved this so much that he played with it for days over any of his new toys! Next up, Spiderman! He started off showing the kids how he shoots webs. And how he walks on his hands! And then Captain America showed some of his moves. And then Iron Man. I love how even Spiderman is doing the moves, all of the characters were so involved and SO awesome!! One of Dallin's other favorite things to do is to sword fight or "play fight", so I figured it couldn't get much better for a little superhero fan than to sword fight with real superheroes!! 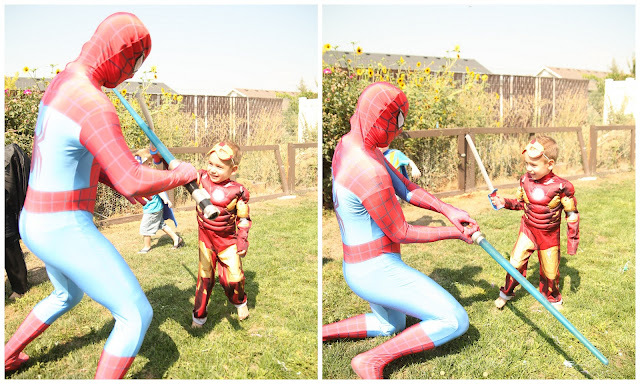 So we all went outside, handed the kids foam swords, and they fought the superheroes! 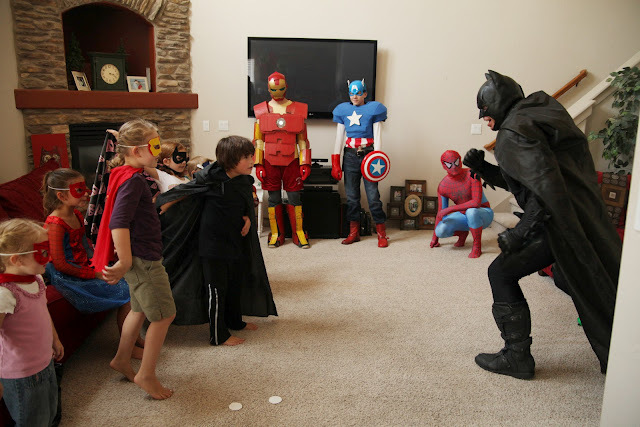 They had SO much fun doing this that I had the hardest time telling them to come in to eat and only did because poor Batman was sweating to death! Dallin and Captain America. This picture makes me smile so big. 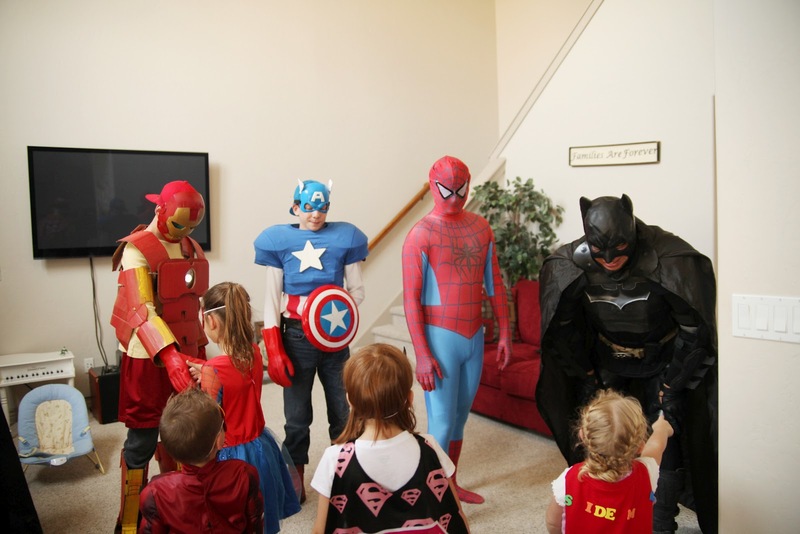 When the superheroes were about to show the kids their superhero moves, Dallin was just staring at Captain America and said, "I could go get my shield!" I told him to go get it, so he ran as fast as he could upstairs and got his new shield. This kid melts me. Dallin and Luke LOVED it when Spiderman fell down "dead" during the sword fight. The kids ended up chasing the superheroes around the yard, and the superheroes were running for their lives when there were multiple kids after them! Spiderman and the birthday boy! He had the time of his life! !